As a general rule New Approach directives including Directive 94/9/EC provide for the affixing of the CE marking as part of the conformity assessment procedures in the perspective of total harmonisation. The conformity assessment procedures to be applied are described in the relevant New Approach directives, based on the conformity assessment procedures as defined by Council Decision 93/465/EEC. Where a product is subject to several directives, which all provide for the affixing of CE marking, the marking indicates that the product is presumed to conform to the provisions of all these directives. During the transitional period of a New Approach directive the manufacturer has the choice to either meet the requirements of this directive or the previous relevant regulations. The option chosen, and hence the extent of the conformity expression enshrined in the CE marking, must be indicated by the manufacturer in the accompanying documents. Any misleading marking in the sense of the any of these directives is forbidden. As this guide has been especially drafted to facilitate the application of Directive 94/9/EC, the following explanations refer only to this Directive. If other directives are applicable in parallel, their provisions have to be taken into account in addition to those of Directive 94/9/EC. CE marking is used by the manufacturer as a declaration that he considers that the product in question has been manufactured in conformity with all applicable provisions and requirements of Directive 94/9/EC and that the product has been the subject of the appropriate conformity assessment procedures. The CE marking is mandatory and must be affixed before any equipment or protective system is placed on the market or put into service. As stated in Article 8 (3) components are excluded from this provision. Instead of being CE marked, components have to be delivered with a written attestation stating the conformity with the provisions of the Directive, stating their characteristics and indicating how they must be incorporated into equipment or protective systems. This separate statement goes along with the definition of components, which have as structural parts no autonomous function. In general the CE marking must be affixed during the production control phase by the manufacturer or his authorised representative established within the European Union. In certain cases it is possible to affix the CE marking earlier, e.g. during the production phase of a complex product (e.g. a vehicle). It is then necessary that the manufacturer formally confirms the compliance of this product with the requirements of the Directive in the production control phase. The CE marking must consist of the initials "CE" taking the form described in Annex X to Directive 94/9/EC. In general the CE marking must be affixed to the product or to its data plate. However, although it is not a requirement in Directive 94/9/EC, it is considered reasonable to affix the CE marking to the packaging and to the accompanying documents if it is not possible to affix it to the product because of the product's size or nature. Depending on the conformity assessment procedure applied, a Notified Body may be involved in the design phase (Annex III), the production phase (Annexes IV, V, VI, VII, IX) or in both phases. The identification number of the Notified Body only has to accompany the CE marking if the Body is involved in the production control phase (see Article 10(1) of Directive 94/9/EC). It is necessary to avoid any misleading information on equipment, for example the number of the Notified Body, where this is not foreseen by the Directive. Hence, the product should not have the number of a Notified Body affixed, if falling under Category 3 (other than Unit verification), as well as some Category 2 equipment, and for any voluntary certification. Where equipment that has already been placed on the market is incorporated into a product (e.g. an assembly according to 3.7.5.1), the integrated equipment must bear the CE marking and, if appropriate, the identification number of the Notified Body. Whilst it is recognised that sub assemblies may have CE marking affixed in their own right these might not be visible following construction of the final product. This is acceptable as this information can be found elsewhere. However, the final product must have a single label clearly relating to its final assembly prior to it being placed on the market and/or taken into service. In affixing the CE marking to the final product the manufacturer or his authorised representative accepts full responsibility for the conformity of the final product to the applicable Essential Health and Safety Requirements of Directive 94/9/EC and all other relevant directives. 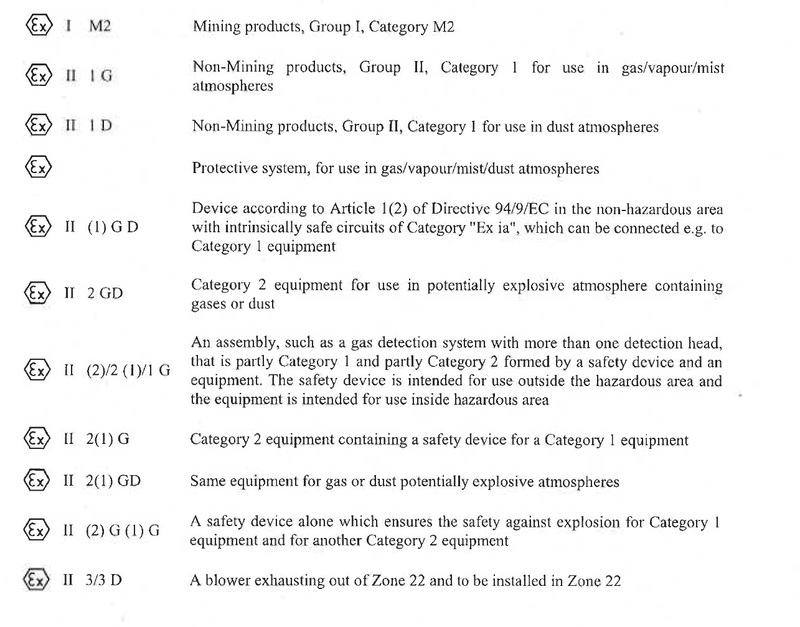 Moreover, devices according to Article 1.2 of the Directive, and separately placed on the market, shall be marked with the category of the equipment under control in round brackets, and such devices which contain an own potential ignition source intended for use in a potential explosive atmosphere shall be marked as equipment according to Annex II clause 1.0.5. All products must be marked with the name and address of the manufacturer, designation of series or type, serial number (if any) and the year of construction. The product must be accompanied with written information explaining the different categories and the consequences for the intended use. Where a product is covered by more than one New Approach directive, CE marking denotes compliance with the appropriate provisions of all relevant directives. However, where one or more of these directives are in their transitional period and, as a consequence, allow the manufacturer to choose which arrangements to apply, the CE marking indicates conformity only to those directives where application is mandatory and others which are so applied. In the case of these latter directives particulars must be given in the documents, notices or instructions accompanying the product or, where appropriate, on the data plate. Because of the special importance for the safety of products intended for use in potentially explosive atmospheres and in order to avoid any misunderstandings Directive 94/9/EC provides for additional markings (see Annex II 1.0.5. Marking). It is stated in Annex II 1.0.5 to the Directive that equipment, protective systems and components must furthermore be marked with all necessary information essential to the safe use. According to this requirement European standards for electrical and non-electrical products for potentially explosive atmospheres foresee a supplementary marking. For detailed and complete information about this marking it is necessary to use these standards. The person responsible for the placing on the market and/or the putting into service of a product has to mark it with the name and the address of the manufacturer, according to Annex II to Directive 94/9/EC, clause 1.0.5. The Directive leaves it free to choose between trademark and company name if there is a difference. The address must be shown on the marking. This address can be simplified if there is not really enough room on small products, as long as the responsible person can always be identified. In any event, the address on the plaque must be sufficient for mail to reach the company. An internet address is not sufficient but the postal address has to be given. In some countries a unique postal code identifies an address. The use of this postal code is sufficient with the country. The question has arisen, whether the marking of components is mandatory. where a manufacturer who wanted to use a component might have serious problems undertaking his risk assessment, if there is no indication about the category of the component. Apart from the question of marking, the Directive requires an attestation of conformity for components. The latter shall give all the necessary information stating the characteristics. This normally occurs assigning to the component an explosion classification according to relevant harmonised standards, which looks like a marking (e.g. Ex II 1/2 GD cb Tx or Ex II 1 GD c Tx). It has also to be considered that size is a problem impeding marking on a product. In these cases, the information should be given in the accompanying documentation and on the packaging of the component subject to marking. Finally, it is recalled that, according to Directive 94/9/EC, ATEX components shall not bear the CE-marking. In accordance with the guidance given to the CE marking of products, it is also considered reasonable to affix all other marking to the packaging and the accompanying documents if it is not possible to affix it to the product because of the product's size or nature. the name or registered trade mark of the manufacturer. The marking of assemblies is identical to the marking of equipment, in particular equipment having different categories. An assembly may consist of a large number of assessed and compliant items (equipment, protective systems, safety devices) with their own specific marking, potentially of different categories. In such cases it would not be helpful to show all of these the individual markings in the marking of the complete assembly. Nevertheless, the marking of the assembly has to display all relevant information required by Annex II, 1.0.5, of Directive 94/9/EC necessary for the intended use of the assembly as a whole. The marking shall be placed in such a way – e.g. on the outer housing of the assembly – so that there is no doubt that it shows the characteristics of the whole assembly and not just one part. Where the individual parts of the assembly are marked for potentially explosive atmospheres having different characteristics, the part with the lowest level of safety defines the marking of the whole assembly. That means that the category, temperature class, explosion group etc with the lowest requirement for the equipment has to be used for the marking of the whole assembly. A pump unit consisting of a liquid pump (non flammable liquid) and driving electric motor. The pump is marked II 2 G T6, the motor II 2 G IIB T4. The whole assembly shall be marked II 2 G IIB T4, as the motor is the part that meets the lower requirements. A fan conveying a IIA T3 explosive atmosphere (Zone 1), the fan fitted with an electric motor and some control devices placed in a Zone 2, the fan accordingly marked II 2/3 G IIA T3. The motor is marked II 3 G T3, the intrinsic safe control device II 2 G IIC T6. As the intrinsic safe control device is placed in the same atmosphere as the motor, the part meeting the lower requirements (in this case the motor) is the decisive item. Accordingly the marking of the whole assembly is II 2/3 G IIA T3.